Chicken tenders are incredible, but they can also sometimes be an incredible pain to make. Frying chicken tenders is messy and so is baking them. Since I have Celiac’s, making chicken tenders gluten free is especially difficult as gluten free bread crumbs are, well, kind of gross. Thankfully, I found a way to make gluten free chicken tenders in my air fryer that are absolutely incredible! Preparing chicken tenders in the air fryer is the easiest way to quickly prepare chicken that’s crispy and tender without making a giant mess in the process. 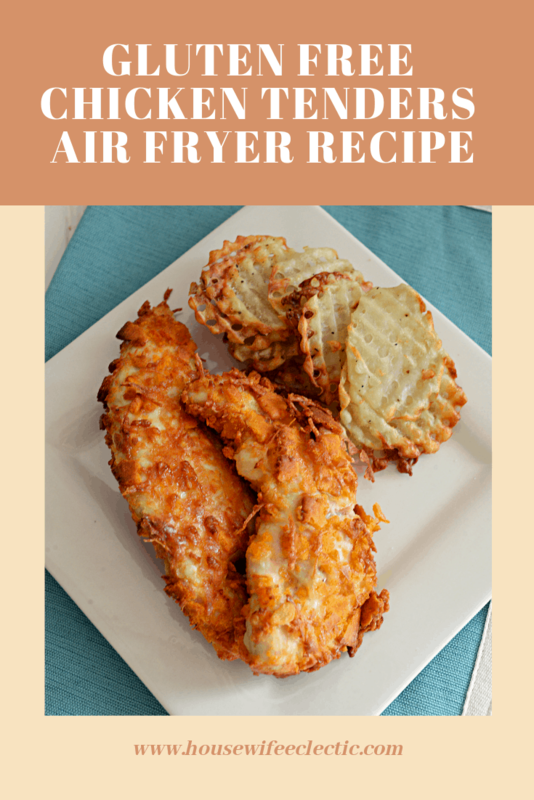 Give this gluten free air fryer chicken tenders a try. Place cheese crackers in a Ziploc bag and carefully crush the crackers. You want small pieces, but not into a pure powder. The small pieces will add texture to the tenders. Pour the crushed crackers onto a deep dish and mix in the Parmesan cheese. In a large bowl, beat the eggs with the garlic salt and onion powder. Dip the chicken tenders in the egg mixture, then coat in the crushed crackers. Pack the crumbs onto the tender. Place the coated chicken tenders in one layer in the air fryer. You may need to do this in multiple batches to avoid overcrowding. Lightly coat with vegetable oil spray. Fry at 400 degrees for 12 minutes, flipping once after 8 minutes. These chicken tenders come out crispy on the outside and incredible moist and tender on the inside. They go perfectly with ranch, sweet chili sauce, or BBQ sauce. We like to use our second air fryer to make homemade French fries as a side. Air fryer chicken tenders are a family friendly meal that’s quick to make and sure to make everyone happy. Give it a try!